Derrick Rose remains out this season after a torn medial meniscus, a similar injury which Thunder guard Russell Westbrook suffered last spring when he tore his lateral meniscus. Westbrook subsequently had swelling and had arthroscopic surgery this season. Though he’s playing one game of back to backs, Westbrook started Monday against the Bulls and didn’t want to hear that he’s not at full strength. Perhaps without quite the attitude, you might expect the same confidence from Rose when he returns from his injury next season. Yes, Westbrook speaks just like he plays, with an uninhibited fury. But he’s also as confident about the return of Rose, with whom he works out with in the summers, as his own recovery and return. “Very confident,” Westbrook said when asked about Rose’s return. “I’ve talked to him numerous times. He’s a tough guy, as you guys know. He does a good job of coming out competing. It’s unfortunate he had to be hurt and out another year. But he’s going to come back the same D Rose he was before. 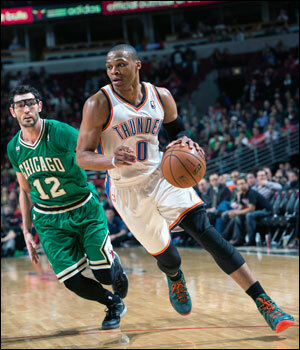 “Just being confident,” Westbrook said about coming back from the injury. “You have to have confidence in yourself and health and knowing the rehab and all the work you put in has paid off. Obviously (rehabilitation) is a tough process. But it’s something I have to deal with and something that’s best for my health and for my future. Westbrook added he doesn’t scrimmage in the summers and doesn’t think Rose needs to as well.